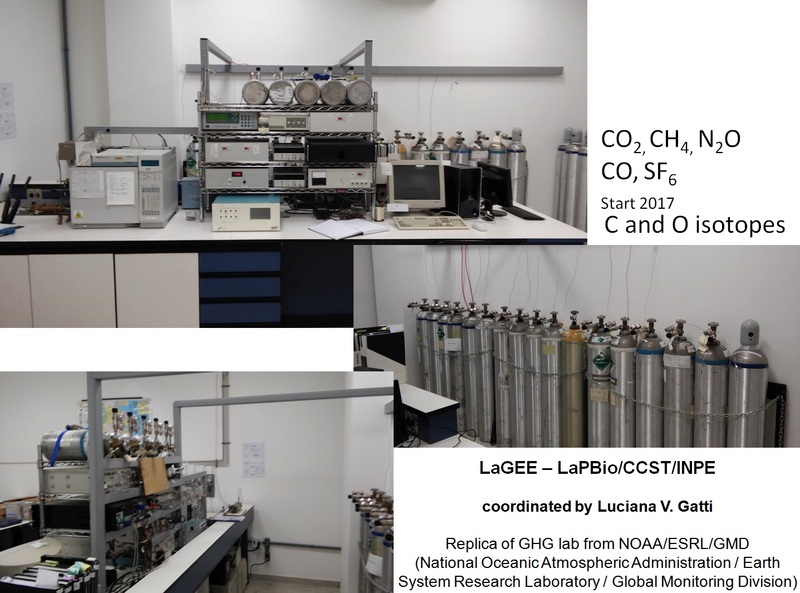 At 2003 it was constructed of a replica of GHG system analysis at NOAA/ESRL/GMD (LaGEE – Greenhouse Gas Laboratory) measuring CO2, CH4, N2O, CO and SF6 and was installed in Brazil in 2004 at IPEN (Nuclear and Energy Research Institute). In 2015 LaGEE was moved to INPE (National Institute for Space Research)/CCST (Center for Earth System Science). 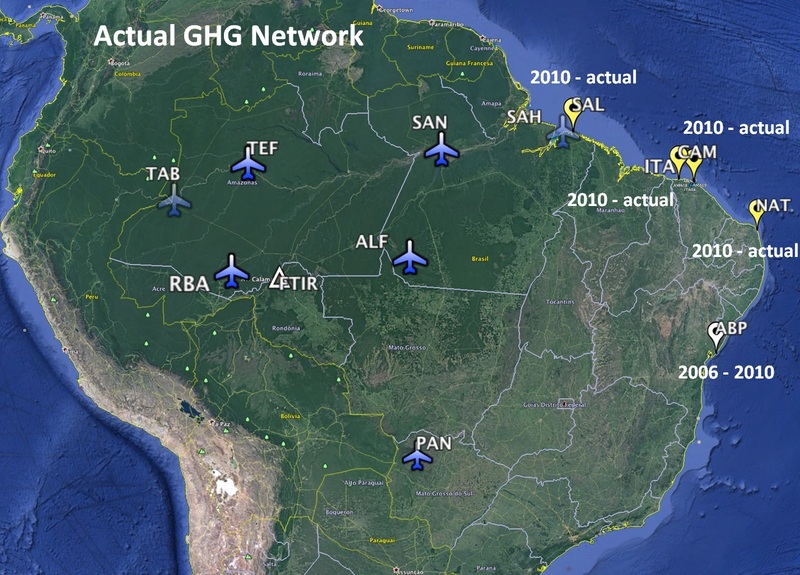 The scientific objectives are to study GHG Balances over Amazon Basin, measurements at Brazilian Coast and recently study methane emissions from Pantanal, an important flooded area in Brazil. 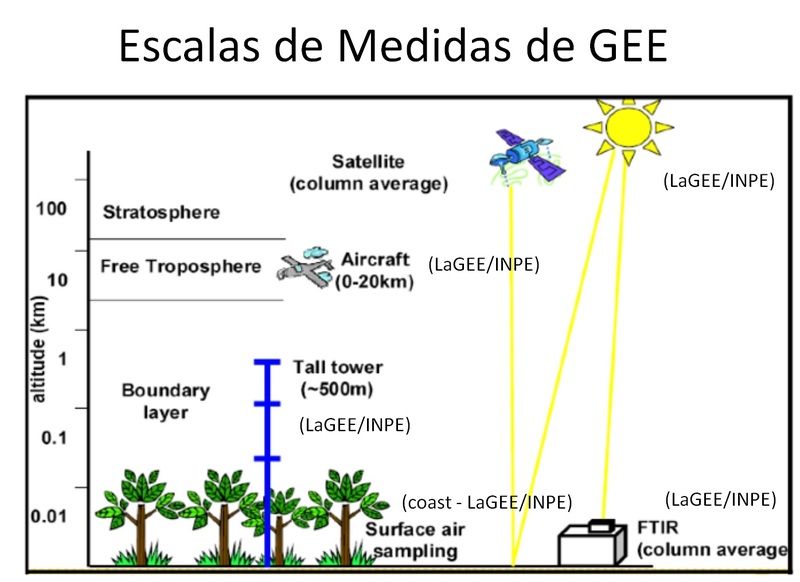 Starting at 2013 until 2015 a project integrating vertical profiles until 7.2km height and GOSAT Satellite measurements performed comparisons in 2 kind of ecosystem: forest (RBA site) and coast SAH (Salinópolis High profiles). Until April 2015 at IPEN it were performed 430 vertical profiles at these 7 sites. Since we moved the LaGEE to INPE/CCST the vertical profiles restart and until today we performed 50 vertical profiles, which in 2016 RBA and ALF aircraft sites running and the 3 coast sites (SAL, CAM and NAT) continue running. In 2016 a new measurements using FTIR (TCCON new site) start to be made with a partnership of BIRA-IASB / IFRO and INPE. 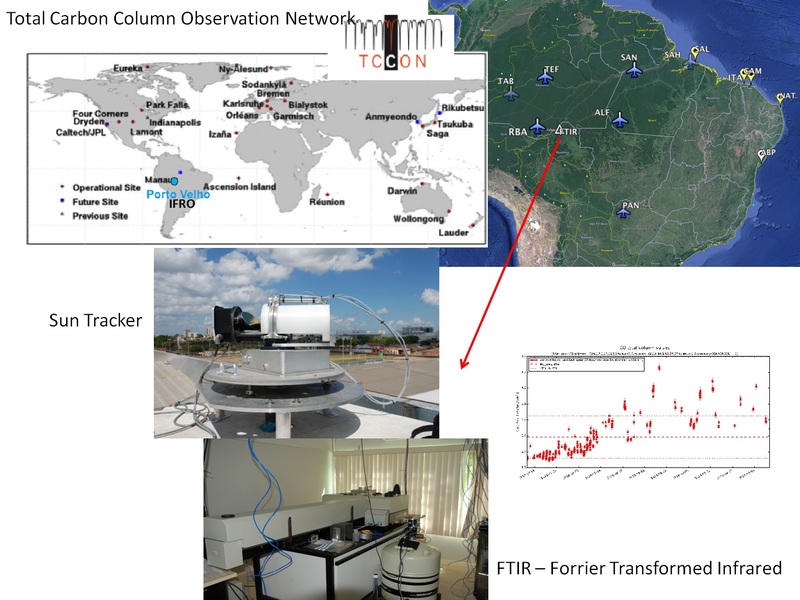 The instrument is installed in a IFRO campus at Porto Velho, Rondonia (8.74S, 63.87W). In 2017 we returned the 4 Amazon sites (RBA, ALF, TEF and SAN) and add a special measurements at coast in a 100m tower at Itarema, Ceará state with weekly flask samples. 3.AMAZONICA – Amazon Integrated Carbon Analysis, UK-Brazil Consortium coord. By Dr. Manuel Gloor and funded by NERC (NE/F005806/1) from 2009 to 2015. 4.CARBON TRACKER – Carbon Tracking and Water Routing: Control of Climatic Changes and Variability, coordinated by Humberto Rocha and Funded by FAPESP (08/58120-3) from 2009 to 2014. 5.GEOCARBON – Global Carbon Observing System, Funded by 7th Framework European Union’s Research and Innovation funding programme (283080) From 2011 to 2015. 6.Continental and Oceanic CO2 Fluxes, coordinated by Humberto Rocha and Funded by CNPq (403241/2012-3), from 2012 to 2014. 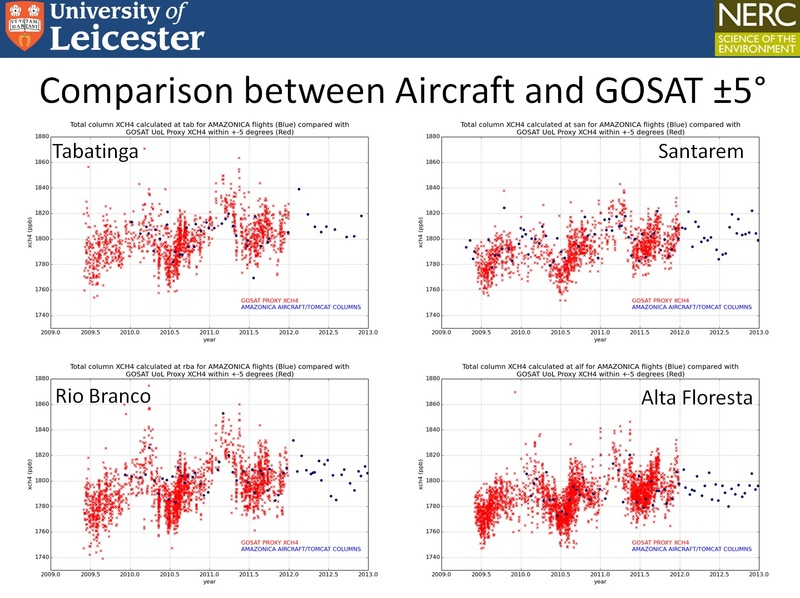 7.ACO – Overview of Aircraft flights from the Amazonian Carbon Observations, UK-Brazil Consortium coord by Hartmut Boesch and funded by NERC (NE/J016233/1) and FAPESP (11/51841-0) from 2012 to 2015. 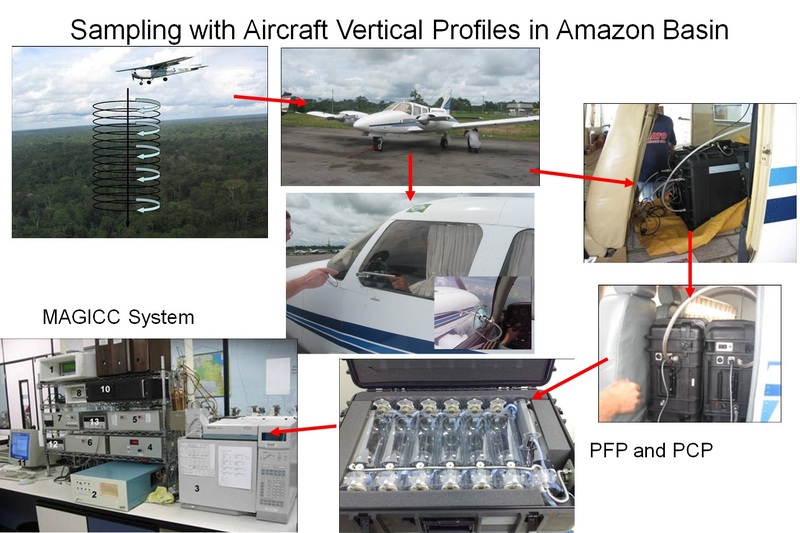 9.ASICA – New constraints on the Amazonian carbon balance from airborne, coordinated by Prof. Wouter Peters, financed by European Research Council (ERC) under Horizon 2020 (2015-2020), funded € 812,170.63. 10.A Tropical Airborne Validation Capability for OCO-2. Coordinated by Dr. John B. Miller (2014 – 2017), funded by NASA, funded US$ 96,000.00 for vertical profiles. 11.Validation of OCO2 column CO2 over Tropical South America via Inverse Modeling of in situ Measurements. Coordinated by Dr. John B. Miller (2015 – 2018), funded by NASA, funded US$ 118,453.00 for vertical profiles. 12.Scaling from Flux Towers to Ecosystem Models: Regional Constraints on Carbon Cycle Processes from Atmospheric Carbonyl Sulfide, coordinated by Dr. Elliot J. Campbell, funded by NASA, Dr. Joe Berry will participate in the installation of COS instrument and development of methodology. 13.Moya – The Global Methane Budget: Track Records, coordinated by Dr. Euan Nisbet, Royal Holloway, Univ. of London (RHUL), financed by UK NERC grant, (£ 80,000.00 for INPE group). from 2016 to 2020. 14.Caracterização da Distribuição das Concentrações de GEE nas Massas de Ar que Chegam a Costa Norte/Nordeste do Brasil”, coordinated by Dr. Luciana V. Gatti , CNPq Universal project, 480713/2013-8 – (2013-2017), (R$ 40,000.00). 1.Gatti, L.V., Gloor, M., Miller, J.B., Doughty, C.E., Malhi, Y., Domingues, L.G., Basso, L. S., Martineswki, A., Correia, C.S.C., Borges, V.F., Freitas, S., Braz, R., Anderson, L.O., Rocha, H., Grace, J., Phillips, O.L., Lloyd, J. 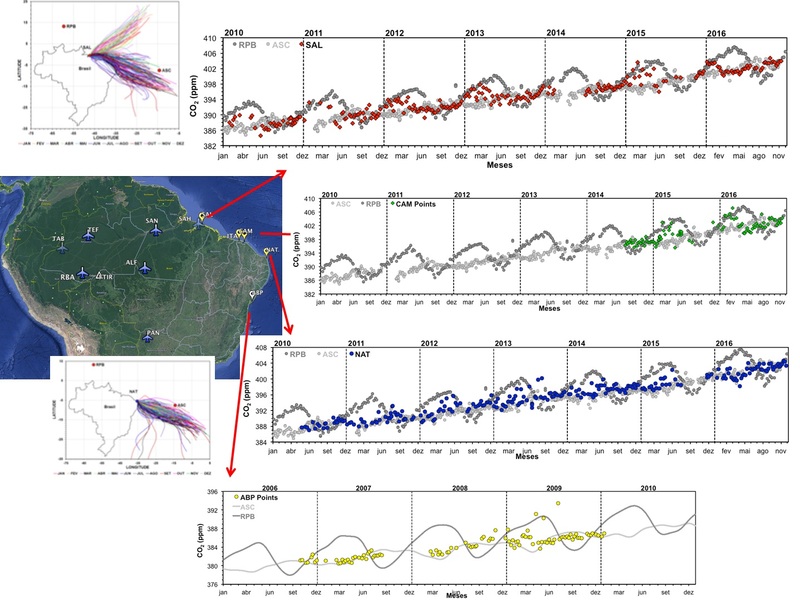 (2014), Drought sensitivity of Amazonian carbon balance revealed by atmospheric measurements. Nature (London), v.506, p.76 – 80, 2014. Paper showed in the cover. DOI: 10.1038/nature12957. 108 times cited (The more important group publication was a Nature paper that was cover in the 6 Feb 2014 Edition). 2.C. B. Alden, J. B. Miller, L. V. Gatti, E. M. Gloor, K. Guan, K. Thoning, C. S. C. Correia, L. G. Domingues, L. S. Basso, D. Touma, I. van der Laan-Luikx, I. van der Velde, T. van Leeuwen, Y. Shiga, J. Joiner, A. Andrews, N. Diffenbaugh, (2016), Regional atmospheric CO2 inversion reveals seasonal and geographic differences in Amazon net biome exchange. Global Change Biology, v.22, p.8. 3.C. Wilson, E. Gloor, L. V. Gatti, J. Miller, A. Bloom, S. A. Monks, L. Basso, A. Crotwell, M. P. Chipperfield (2016), Basin-wide quantification and attribution of Amazon methane emissions in 2010 and 2011, Biogeochemical Cycles, v.30, p.400 – 420. 4.S. pandey, S. Houweling, M. Krol, I. Aben, T. Machida, F. Chevallier, E. J. Dlugokencky, L. V. Gatti, M. Gloor, J. B. Miller, R. Detmers, and T. Röckmann (2016) Inverse modeling of GOSAT-retrieved ratios of total column CH4 and CO2 for 2009 and 2010, ACP v.16, p.5043 – 5062. 5.Webb, H. Boesch, R. Parker, L. V. Gatti, M. Gloor, P. Palmer, M. Chapperfield, C. Wilson, J. Miller, L. S. Basso (2016), CH4 concentrations over the Amazon from GOSAT consistent with in situ vertical profile data. Journal of Geophysical Research: Atmospheres. , v.121, p.11,006 – 11,020. 6.Deeter, M. N.; Martínez-alonso, s.; Gatti, L. V.; Gloor, M.; Miller, J. B.; Domingues, L. G.; Correia, C. S. C. (2016), Validation and analysis of MOPITT CO observations of the Amazon Basin. Atmospheric Measurement Techniques, v.9, p.3999 – 4012. 7.Basso, L.S., Gatti, L.V., Gloor, M., Miller, J.B., Domingues, L.G., Correia, C.S.C., Borges, V.F., (2016) Seasonality and inter-annual variability of CH4 fluxes from the eastern Amazon Basin inferred from atmospheric mole fraction profiles. Journal of Geophysical Research: Atmospheres, v.121, p. 168 – 184. 8.I.T. van der Laan-Luijkx, I.R. van der Velde, M.C. Krol, L.V. Gatti, L.G. Domingues, C.S.C. Correia, J.B. Miller, M. Gloor, T.T. van Leeuwen, J.W. Kaiser, C. Wiedinmyer, S. Basu, C. Clerbaux, W. Peters (2015), Response of the Amazon carbon balance to the 2010 drought derived with CarbonTracker South America. Global Biogeochemical Cycles, v.29, p.1092 – 1108. 9.Molina, L., Broquet, G., Imbach, P., Chevallier, F., Poulter, B., Bonal, D., Burban, B., Ramonet, M., Gatti, L. V., Wofsy, S. C., Munger, J. W., Dlugokencky, E., Ciais, P. (2015), On the ability of a global atmospheric inversion to constrain variations of CO2 fluxes over Amazonia. Atmospheric Chemistry and Physics, v.15, p.8423 – 8438. 10.Moreira, D.S. ; Freitas, S. R.; Bonatti, J.P.; Mercado, L.M. ; Rosario, N.M.É. ; Longo, K.M. ; Miller, J. B.; Gloor, M.; Gatti, L.V. (2013); Coupling between the JULES land-surface scheme and the CCATT-BRAMS atmospheric chemistry model (JULES-CCATT-BRAMS1.0): applications to numerical weather forecasting and the CO2 budget in South America. Geoscientific Model Development, v. 6, p. 1243-1259. 11.Saito, R., Patra, P.K., Sweeney, C., Machida, T., Krol, M., Houweling, S., Gatti, L.V., Bouquet, P., Gloor, E., Miller, J.B., Palmer, P.I., Wilson, C. (2013), TransCom model simulations of methane: Comparison of vertical profiles with aircraft measurements, Journal of Geophysical Research – Atmospheres. , v.118, p.3891 – 3904. 12.Gloor, M., Gatti, L., Brienen, R., Feldpausch, T. R., Phillips, O. L., Miller, J., Ometto, J. P., Rocha, H., Baker, T., Houghton, R. A., Malhi, Y., Aragao, L. E. O. C., Zhao, K., Peylin, P., Huntingford, C., Levy, P., Lloyd, J. (2012), The carbon balance of South America: a review of the status, decadal trends and main determinants. Biogeosciences, 9, 5407 – 5430. 13.Querino, C. A. S., Smeets, C. J. P. P., Vigano, I., Holzinger, R., Moura, V., Gatti, L. V., Martinewski, A., Manzi, A. O., de Araújo, A. C., Röckmann, T. (2011), Methane flux, vertical gradient and mixing ratio measurements in a tropical forest. Atmospheric Chemistry and Physics , v.11, p.7943 – 7953. 14.Gatti, L. V.; Miller, J. B.; Damelio, M. T. S.; Martinewski, A.; Basso, L. S.; Gloor, M. E.; Wofsy, S.; Tans, P. Vertical profiles of CO2 above eastern Amazonia suggest a net carbon flux to the atmosphere and balanced biosphere between 2000 and 2009. Tellus. Series B, Chemical and Physical Meteorology. Fator de Impacto(2015 JCR): 2,4020, v.62, p.581 – 594, 2010. 15.Bergamaschi, Peter; Frankenberg, Christian; Meirink, Jan Fokke; Krol, Maarten; Villani, M. Gabriella; Houweling, Sander; Dentener, Frank; Dlugokencky, Edward J.; Miller, John B.; Gatti, Luciana V.; Engel, Andreas; Levin, Ingeborg, Inverse modeling of global and regional CH 4 emissions using SCIAMACHY satellite retrievals . Journal of Geophysical Research. Fator de Impacto(2015 JCR): 3,3180, v.114, p.D22301 – , 2009. 16.Dlugokencky, E. J.; Bruhwiler, L.; White, J. W. C.; Emmons, L. K.; Novelli, P. C.; Montzka, S. A.; Masarie, K. A.; Lang, P. M.; Crotwell, A. M.; Miller, J. B.; GATTI, L. V., Observational constraints on recent increases in the atmospheric CH burden. Geophysical Research Letters. Fator de Impacto(2015 JCR): 4,2120, v.36, p.L18803 – , 2009. 17.D’Amelio, M. T. S.; Gatti, Luciana V.; Miller, J.; Tans, P., Regional N2O fluxes in Amazonia derived from aircraft vertical profiles. Atmospheric Chemistry and Physics, v.9, p.8785 – 8797, 2009. 18.Meirink, Jan Fokke; Bergamaschi, Peter; Frankenberg, Christian; d&apos;Amelio, Monica T. S.; Dlugokencky, Edward J.; Gatti, L. V.; Houweling, Sander; Miller, John B.; Röckmann, Thomas; Villani, M. Gabriella; Krol, Maarten C., Four-dimensional variational data assimilation for inverse modeling of atmospheric methane emissions: Analysis of SCIAMACHY observations. Journal of Geophysical Research, v.113, p.D17301 – , 2008. 19.Miller, J. 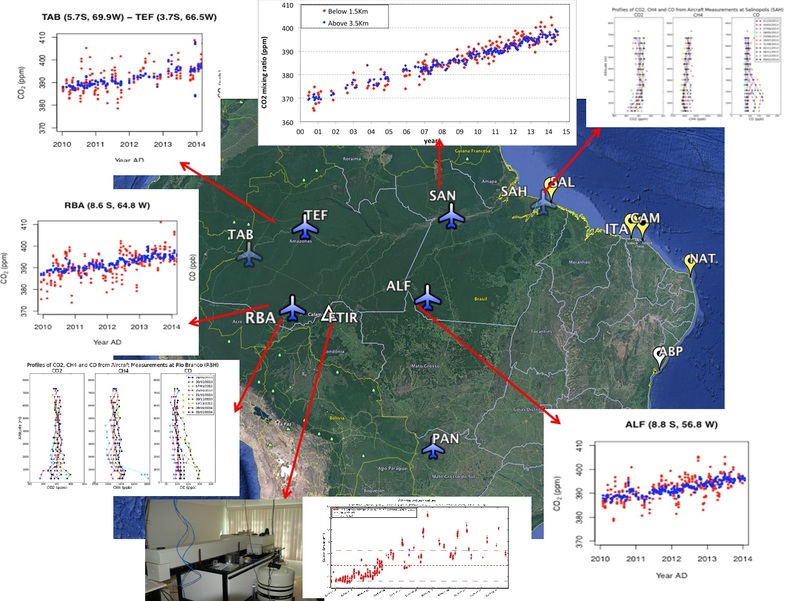 B.; Gatti, L. V.; D’Amelio, M. T. S.; Crotwell, Andrew M.; Dlugokencky, Edward J.; Bakwin, P.; Artaxo, P; Tans, Pieter P. Airborne measurements indicate large methane emissions from the eastern Amazon basin. Geophysical Research Letters. Fator de Impacto(2015 JCR): 4,2120, v.34, p.L10809 – , 2007.